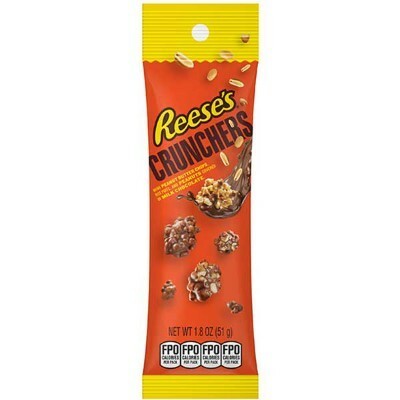 A Reese's Crunchers Tube is a new twist on an old favorite. 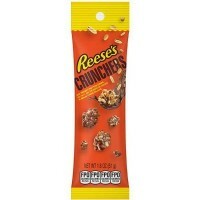 If you crave the scrumptious taste of Reese's peanut butter cups, then you'll LOVE Reese's Crunchers. Each 1.8oz tube of this tasty American snack is filled with crunchy peanuts, crispy puffs, and creamy peanut butter chips that are covered in milk chocolate. It's delightfully delicious! Milk chocolate [sugar, cocoa butter, chocolate, nonfat milk, milk fat, lactose (milk), soy lecithin E322, emulsifier , emulsifier], peanuts, rice flour, partially defatted peanuts, sugar, hydrogenated vegetable oils [palm kernel, soybean oil], 2% or less of: corn syrup solids, dextrose, salt, reduced protein whey (milk), malt extract, palm kernel oil, emulsifier E471, vanillin, artificial flavor. Contains GMO. Nutrition facts (for 100g): calories 510Kcal, total fat 27.5g (saturated fat 13.7g), total carbohydrate 58.8g (sugar 43.1g), protein 11.8g, salt 0.6g.